The Cleveland Browns welcome the St. Louis Rams back to their ancestral home on Sunday. The Browns come into the game having lost four out of their last five, while the Rams are riding a streak that has seen them drop nine out of their last 11 games dating back to last season. Should be one heck of a day. Rams running back Steven Jackson is the key to the game. Jackson has rushed for 289 of his 579 yards over the past two games and his 5.1 yards per carry is the highest since his rookie year. At that pace, if Jackson hadn’t missed most of three games he would be among the league leaders in rushing yardage. The Browns, of course, have the 31st-ranked rush defense in the NFL, giving up 144 yards per game on the ground. And they will be without safety T.J. Ward this weekend (and perhaps longer), which means more Usama Young at the position. If the Browns – who have given up 151 yards rushing to Oakland, 174 to San Francisco and 261 to Houston – can keep Jackson under control, they have a real chance to win the game. If – and that is currently a big if – the Browns were ever going to get anything going on offense this would be the week. The Rams are 32nd against the run and have put eight cornerbacks – including three of their top four – on injured reserve since the start of training camp. Of course, St. Louis allowed a season-low 262 yards last week, the second consecutive game they’ve held their opponent under 300 yards. But, still, we don’t think it’s asking too much for the Browns to outscore a team that is only averaging 12.5 points per game. 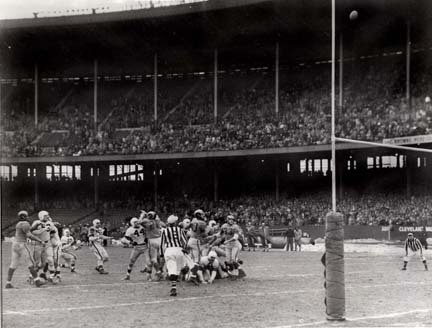 The 1950 NFL Championship Game, won by Cleveland, 30-28, on Lou Groza’s 16-yard field goal. The Browns also beat the Rams for the 1955 title, and lost to them in 1951 – breaking a six-year run of titles in Cleveland. This game has Phil Dawson written all over it. The Browns just need to keep Jackson under control, keep the game close and let Dawson win it with his leg – would it really be that hard for anyone to imagine a 3-0 Browns win? We’ll take the Browns minus the points. Record picking the Browns (using the point spread) this year: 5-2-1.